Everybody knows that it can sometimes be a lonely world out there. 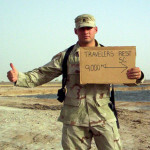 Big John created this page to show a little bit of love for all of the other travel bloggers wanting more visitors. If you wish to have your blog to appear on this page, submit a link in the comments section below. Completely Gone Nomad Travel blogger & photographer. Living between UK, SE Asia & S. America. Girl vs Globe She’s a blogger & globetrotting troublemaker. In love with travel, food & fashion. The Lucky Couple An ongoing tale of 2 twenty somethings that left their jobs, sold their crap, and moved around the world. My Travel Wildlife Meet Nicole LaBarge, a self-proclaimed travel-aholic, foodie, & photographer who’s seen the world. Shameless Traveler Shamelessly traveling the world living his life to its fullest. Check him out for travel tips, motorcycles, martial arts, & mayhem. She’s Gone Global Read her latest traveling blog posts for stories and insights into world destinations and amazing life lessons. A Travelling Circus Mum, Writer, Traveller – went 6mths backpacking with daughters. Travel This Earth A foodie and a merchant marine linked up to travel the world. Travelsauro.com Visit Miguel as he wanders off the beaten path into adventurous places like Papua, Africa, the Caribbeans, etc. path adventures in places like Papua, Africa, the Caribbeans, etc. My pleasure! Will do that now!